20 inches / 52 cm wide by 48 inches / 122 cm long. 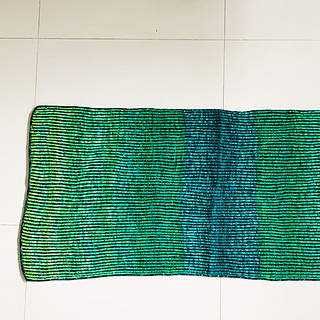 Featuring a springy, dimensional i-cord edging and a unique double color gradient, this reversible rectangular wrap is an elegant and polished addition to your knitted wardrobe. 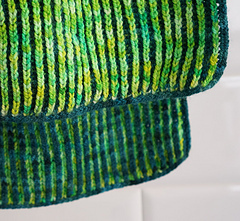 The gradient yarn used on this project is truly a labor of love. It starts with two strands that are wound together, cake dyed so that they are exact duplicates, and then divided back into two strands. This painstaking process yields a double treat - you get to enjoy every lovely speckle and tonal color change twice. 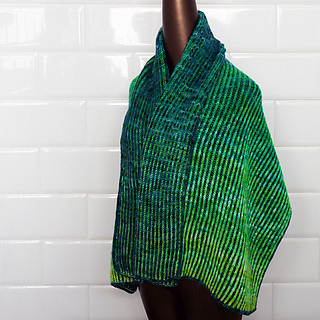 This pattern includes a photo tutorial for the two-color i-cord cast on, and two pattern versions – the original Bounded Brioche Wrap in Aran weight, and Rothko in Sport weight featuring a gorgeous gradient. Skill Level: Suitable for those new to brioche. Skills Needed: Basic knitting skills plus Judy’s Magic Cast-on, i-cord, and grafting / Kitchener stitch. Finished Size: 20 inches / 52 cm wide by 48 inches / 122 cm long. 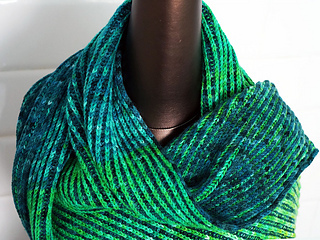 Yarn – Sport Weight Version: MC - Infinite Twist Helix, 650 y / 240 g. Shown in Cypress. CC – Infinite Twist Helix Superwash Double Gradient, 2 cakes, 300 y / 100 g each, 600 y / 200 g total. Shown in Neon Garden. U.S. size 5 / 3.75 mm double-pointed needles plus circular needle, 32 inch / 80 cm long, or any size yielding correct gauge. Gauge (before blocking): 11 brioche ribs / 23 knit rows over 4 inches / 10 cm in two-color brioche ribbing. Notions: yarn needle. Optional: locking stitch markers.